(Dan Trimmer, 2001). Tet. 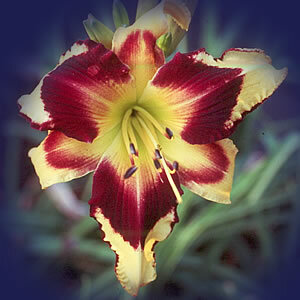 (Canadian Border Patrol x Tetra Indian Sky) 32” EM RE Everybody who visits the garden asks about 6 ¾” RAPID EYE MOVEMENT. It is the result of only three seeds I got from a conversion of INDIAN SKY, which is a long petaled cultivar with as large and as bold an eye as I have ever seen. 2nd and 3rd generation offspring from RAPID EYE MOVEMENT pollen maintain the general appearance we see in this catalog but the bloom size and eyezone size can be greatly increased. 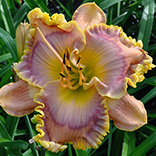 This cultivar can be used in both round ruffled programs and spidery crosses with great success. Anybody working with eyezones should give this cultivar consideration.